1. 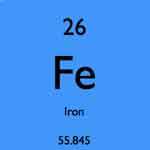 The most common of the iron deficiency symptoms is the severe feeling of fatigue. 2. The skin will lose its healthy glow as it begins to present a pale cast. The tongue can become sore or inflamed. 3. Beside the allover weakness that is another highly common symptom of an iron deficiency, an irregular heartbeat, or arrhythmia may be experienced as well. 4. Headaches will begin to creep up more often. 5. With or without activity, shortness of breath may be commonly experienced. 6. If lightheaded or dizzy, one may become suspicious of an iron deficiency being present. 7. When your hands and feet seem to never warm up no matter what, an iron deficiency may be the culprit of such annoying symptoms. 8. Besides brittle nails, iron deficiency and hair loss is another ordinary symptom of an iron deficiency. 9. Irritably from that overall feeling of exhaustion caused by an iron deficiency is common by those suffering from the condition. 10. Of all the iron deficiency symptoms, the strangest sign is the craving for non-food substances like dirt, solid starch, or ice. The only way to be sure there is an iron deficiency present is to see a doctor who will initiate the proper examination and tests to confirm the diagnosis before treatment begins.